Research ››› April 6, 2016 8:16 AM EDT ››› CRISTINA LóPEZ G.
The Washington Post reported that Republican presidential front-runner Donald Trump said he would compel Mexico to pay for his proposed border wall by threatening to block money that Mexican immigrants send to their home country, commonly known as remittances. The Post called the proposal's legality "unclear," while other media outlets, including the digital news division for the largest Spanish-language network, Univision, also cast doubt on the plan's feasibility and ethics. Fox News Discouraged Presidential Candidates From Courting Latino Voters, But Fox News Latino Calls Them "An Important Voting Bloc"
Research ››› October 6, 2015 5:53 PM EDT ››› CRISTINA LóPEZ G.
Fox News Latino highlighted how presidential debates, forums, and media coverage of Republican presidential candidates often miss out on the importance of pressing the candidates on Latino issues despite the growing significance of the Latino voting bloc. Fox News Latino's coverage stands in stark contrast to Fox News' coverage of the Republican presidential candidates, as the network has frequently mocked candidates' use of Spanish language, used incendiary rhetoric to describe Latinos, and encouraged candidates to follow Donald Trump's lead in advocating for harmful anti-immigrant policies. Research ››› September 3, 2015 6:22 PM EDT ››› CRAIG HARRINGTON & CRISTINA LóPEZ G.
Numerous conservative media outlets are parroting the misleading conclusions of a September 2015 report by an anti-immigrant nativist group, the Center for Immigration Studies (CIS), which claims that "immigrant households use welfare at significantly higher rates than native households." Like previous flawed CIS studies, these findings have been called into question by immigration experts for failing to account for the economic hardship of some immigrant families, lumping American-born beneficiaries into "immigrant household" categorizations, and conflating numerous anti-poverty programs with so-called "welfare." Research ››› December 17, 2014 5:05 PM EST ››› JESSICA TORRES & CRISTINA LóPEZ G.
When St. Louis Rams draft Michael Sam kissed his boyfriend in celebration of his historic selection as the first openly gay active NFL player, there were predictable protests of homophobic disgust on social media. The kiss also raised the ire of Fox News, where commentators condemned the kiss as "in your face" and "over affectionate." It's a reaction that highlights the way that modern homophobia can manifest in dishonest calls for "appropriate" behavior. The show's hosts didn't ask Trump to weigh in on this sports-related kiss. On the May 12 edition of The Five, co-host Andrea Tantaros criticized Sam for being "overly affectionate on camera," but avowed that she doesn't like to see public displays of affection by anyone. Bill O'Reilly sounded the same theme on his show that night, saying that "there's no kissing in football" - nobody tell Tom Brady and Gisele Bundchen - and affirming that he opposes public displays of affection between straight people, too. 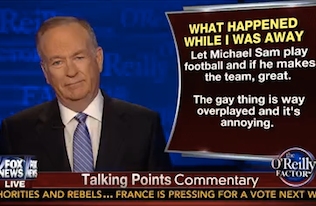 O'Reilly argued Sam's "gay thing" was "way overplayed," "annoying," and "in your face." "Do I really need to see that?" O'Reilly asked. Fox contributor Juan Williams agreed, stating that he, too, found Sam's kiss to be a little too "in your face." Fox News continued its history of undermining Fox News Latino by ridiculing concerns raised by a Mexican-American student -- and shared by Fox News Latino -- after Dartmouth College cancelled an "exploitative" fundraising event. "As a Mexican-born, United-States-raised, first-generation woman of color, it was sadly unsurprising that a culturally-themed party was seen as a casual venture for such a privileged institution such as Dartmouth," she wrote in an email to various college organizations, including the Office of Pluralism and Leadership, and Dean Charlotte Johnson. "There are various problematic structures and ideologies regarding a Cinco de Mayo-inspired event, and I am sure that we, as a Dartmouth community, could learn from the extensive literature written about the Americanization of Cinco de Mayo and its construction as a drinking holiday in the United States, cultural appropriation and the inappropriate usage of cultural clothing, and the exploitation of groups of people and cultures for the sake of business opportunities." TANTAROS: I guess I'm just wondering, what are the rules for cultural sensitivity? So on one hand, universities are encouraging multiculturalism and they're encouraging us to celebrate and include all these other cultures but when we do it we're called racist. So I just want someone to tell me the rules because I love to drink margaritas, I may or may not have been known to wear a sombrero from time to time on Cinco de Mayo, and eat lots of guacamole. Am I a racist? Am I allowed to do that on Monday or not?